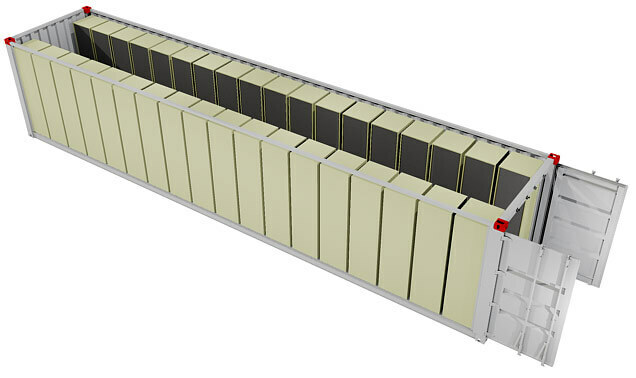 Up to 1 MWh of storage capacity can be packaged into SustainPower’s Battery Storage Container. Ideally suited to accompany open field or roof-top solar PV installations, the rugged and tropicalised container design offers maximised mobility, protection, and durability. High-quality lithium-ion batteries with battery management system. Rugged and tropicalised container design for maximised mobility, protection and durability, with optional insulation and air-conditioning. 20ft high cube container including inverters, batteries and power management equipment. Battery storage containers are custom designed and built to meet customer requirements.